Earlier this month, WhatsApp was reported to be testing a feature called 'Suspicious Link Detection' which enables users to detect harmful links sent and received on WhatsApp. The aim of the feature is to make the platform more secure. With the latest 2.18.221 beta update, WhatsApp is now making the new feature available to Android beta testers around the world. This means that the feature could be rolled out to the main app soon. According to WaBetaInfo, to test the feature, a user will be required to update their WhatsApp beta for Android to version 2.18.221. For those, who have already updated but do not see the feature, the website recommends that testers backup their chat history and reinstall WhatsApp. When you reinstall WhatsApp, the most updated configurations from the server are downloaded. This will enable the feature for the testers. The feature is not available for iOS as of now. 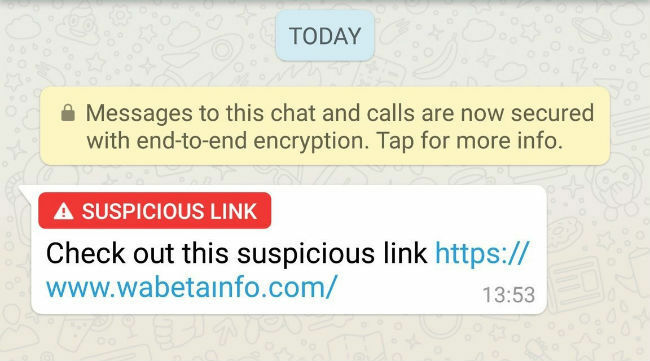 If you receive a message on WhatsApp that contains a dubious link, WhatsApp will mark it suspicious. 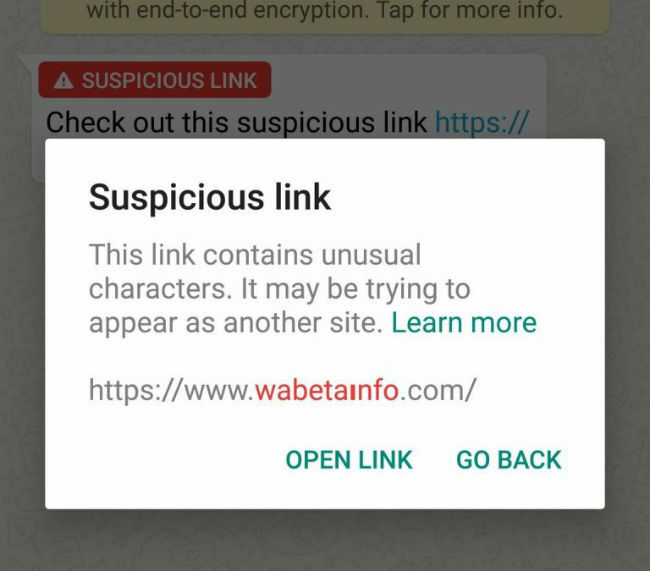 When a user tries to open the suspicious link, WhatsApp alerts the user again that it may appear as a different website, because it contains an unusual character. The report of WhatsApp testing this feature came on the heels of the shocking incidents of lynching in India, fuelled by fake WhatsApp messages. 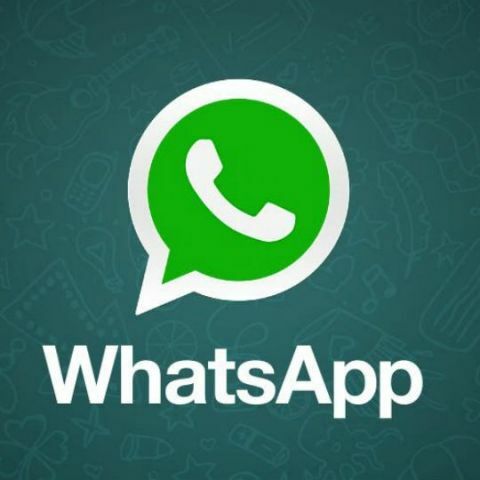 WhatsApp later wrote to the Ministry of Electronics and Information Technology vowing that the platform would help to curb the dissemination of fake news. "We're horrified by these terrible acts of violence and wanted to respond quickly to the very important issues you have raised. We believe this is a challenge that requires government, civil society and technology companies to work together. Many people (nearly 25 per cent in India) are not in a group; the majority of groups continue to be small (less than 10 people); and nine in 10 messages are still sent from just one person to another. With the right action we can help improve everyone's safety by ensuring communities are better equipped to deal with malicious hoaxes and false information -- while still enabling people to communicate reliably and privately across India," the company said. Since June 2017, at least 31 people across 10 states in India have been killed by mobs because of misinformation distributed through forwarded WhatsApp messages. WhatsApp had also announced unrestricted research rewards of up to $50,000 for proposals from social scientists and research groups that propose projects to “enrich” the company’s understanding of the fake news problem.